Grid reference: 501500, 107200, View on: Google Maps, Open Street Map, Streetmap, National Library of Scotland Map or Oldmaps. There are 4800 baptisms in the OPC database. IGI Batch: C070061 (1560 ~ 1876, 1739 ~ 1763, 1813 ~ 1876). There are 93 burials in the OPC database. There are 2762 marriages in the OPC database. IGI Batches: M070061 (1560 ~ 1876); M070062 (1560 ~ 1690). There are 18 images of this church in the OPC database. ST. NICHOLAS. Restored in 1874. Beneath the castle stands the fine lofty cruciform church. It has a nave, aisles, transepts, and tower. The chancel, or Fitz-Alan Chapel, is now walled off from the rest of the church; the space under the tower serving as chancel. The style is Perp., built about 1380. Note the mural paintings - N. wall of N. aisle, The Seven Acts of Mercy and figure of a saint; over N. door, The Seven Deadly Sins; S. wall of S. aisle, portions of another subject; also several consecration crosses; old proches; carved stone pulpit; Perp. font; quatre-foil windows in the clerestory and old vestry. The grille which separated the nave from the Fitz-Alan Chapel is one of the finest pieces of ironwork in the county. This chapel and the Lady Chapel contain the tombs of the illustrious house of Fitz-Alan and Howard. Note the alabaster tomb of Earl Thomas Fitz-Alan; seven brasses - the finest (mutilated) to Thomas Salmon, Chamberlain to Henry V., and his wife (1430); and old stained glass. Near the chapel are some old college buildings to which it was attached. Permission to visit the Fitz-Alan Chapel must be obtained from the Duke of Norfolk's agent. Near the bridge may be seen the ruins of old Maison Dieu or Hospital of the Holy Trinity, erected about the end of the 14th century by the 13th and 14th Earls of Arundel. It was destroyed by Waller's troops. There are 4 documents concerning this church in the OPC database. 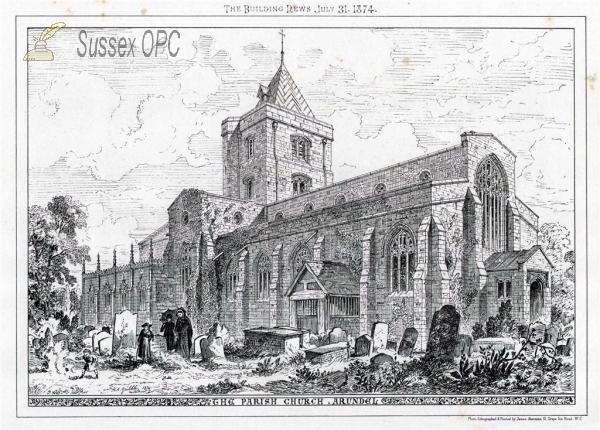 There are 2 articles about this church in the OPC Sussex Archeaological Collections Index.